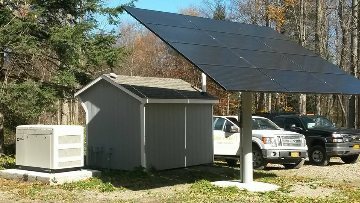 NEW YORK STATE SITEPOWER designs, installs and maintains off-grid power solutions on a regular basis. Using a combination of solar (PV), batteries, generator and inverters, we can provide clean, relaible power to your off-grid camp or home. Why take a chance with a new solar company when you can benefit from the 20+ years experience and multiple successful installations that we've already completed? Our solar engineer is not a salesman, he has actually LIVED off-grid since 1997 - he knows what works and what doesn't. We design the most efficient power system for your off-grid retreat that will provide the greatest return on your investment AND we have plenty of happy references to prove it! Whether you have an existing system that isn't quite up to par, maybe it dosen't quite meet your expectations, or you're looking to build a new power system, we would love to optimize your current setup or be a part of your new project.